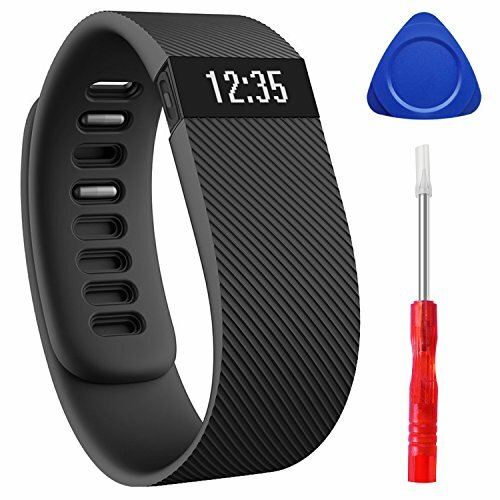 This replacement band with removing tool kits allows you to change band for your existing Fitbit Charge. If you are going to give your Charge another look or just want to repair it by changing its broken band, this is right for you. We have made effort to provide instructions and reliable materials that allow you to avoid huge cost for professional repair. Free size to slide with button, Small (5.5"-6.5"), Large (6.5"-7.7"). This replacement band is made of a flexible, durable elastomer material similar to that used in many sports watches. It also has a water and rust resistance stainless steel button, which is reliable to lock the band securely. Because of the premium materials, the band is rain, splash and sweat resistance but not swim proof or showerproof. From work to workouts, this band can always give your wrist a comfortable fit with style all day long. Repair tools kits come with the band, which include screwdriver and Plastic Triangle tool and Instructions.. These tools are used to remove the Charge from the original band more safely and efficiently. ATTENTION: Please sure you seriously read the assembly instructions before tear down the old Fitbit Charge and install the new strap. One year Warranty, replacement or full refund without return. If you have any questions about this product by HUMENN, contact us by completing and submitting the form below. If you are looking for a specif part number, please include it with your message.